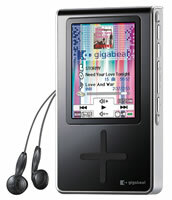 Geekzone reviewed Toshiba Gigabeat X60 MP3 Player, a digital music player that capable of display photos and album covers in full colour on its 2.4 inch QVGA LCD screen and stores audio, music, photos, images and other files in 1.8 inch HDD drive. Geekzone likes the Toshiba Gigabeat X60 for it’s very light and compact, and also features user controllable orientation for display (left or right hand, up/down), QVGA LCD has good color and works well even in daylight, user definable button, USB Cradle connection, no annoying noises or clicks during operation both externally to the device and when listening, integrated Lithium Ion battery with up to 16 hours of charge, can be recharged by the USB connection, big range of preset equalizer options. However, some downsides including music is encoded to secure format, restricting extraction, and volume output is designed for headphones, so stereo must be turned up high to produce good sound level. Geekzone concluded that X60 isn’t exactly a cheap MP3 player. But, with a 60GB hard disk there’s a lot of room for expansion. With plenty of customization available the device can quickly be personalized how you like. If you’re looking for a large capacity device and you’re not worried about content protection restricting you, then you won’t be disappointed.